She is Persephone. Known today primarily as the Spring Maiden, ancient peoples knew her as so much more. It was Persephone they called upon to watch over their marriages, and guard their unmarried daughters. It was Persephone they called upon to curse their enemies and avenge injustices. It was Persephone who offered them a peaceful afterlife through the revelation of her great Mysteries at Eleusis. Today, we are rediscovering the complicated, complex nature of this wise and awesome Goddess. Within these pages are hymns and poems, essays and rituals, artwork and fiction in honor of the Harbinger of Fruit, the Goddess of the Narcissus, She Who Tasted the Pomegranate, the Queen of the Sacred Way. 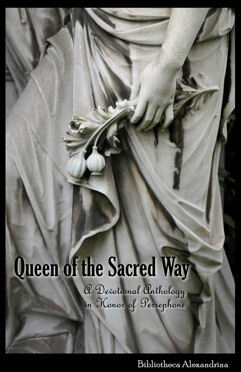 Queen of the Sacred Way may be purchased in paperback format through Amazon, and Barnes and Noble. All of the proceeds from Queen of the Sacred Way – as well as many of the other volumes in the Bibliotheca Alexandrina series – will be used to help promote the revival of the worship of the Greek and Egyptian Gods, with a portion of the proceeds given to a worthy charitable organization in their name. So, not only will you be getting a wonderful book about the modern worship of Persephone – but your money will be going to do good work and help the revival of ancient polytheistic religions. ATTENTION Librarians, Teachers and Retailers: Queen of the Sacred Way is also available at reduced cost for academic institutions, lending libraries (public and private) and retailers. Check our online store, or email baeditor@gmail.com with any questions.